Whether it was hip-hop or punk, Michael Franti has always maintained a sharp social consciousness at the core of his music. It is something he retains after more than 10 years of making music. Franti visited Iraq, Israel, the West Bank and the Gaza Strip in 2004 and was inspired to make a documentary and a new CD titled Yell Fire! 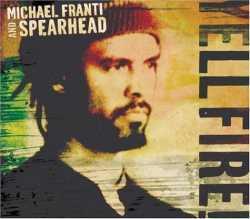 With a mix of hip-hop, rock and reggae, Franti, with his band, Spearhead, lives up to the not-new idea that the personal is political. For Franti, it is vitally important that the humanity of all people is validated and recognized, that peace is a better idea than war. "Time To Go Home" is fervent cry for U.S. soldiers to come back from fighting what he believes is an ill-considered war in Iraq, and "Sweet Little Lies" is a poignant call for questioning what the government tells us. But amidst the serious political critiques is also a sense of joy, as Franti sings rousing odes to party for peace and love, inviting us to join him on his quest for a world without violence and hate. Thankfully, Franti doesn't preach. He just politely persuades.